No selecting an owner this time. Just lawless capitalism and billionaires fighting over one of the world’s rarest cars. Getting ahold of the LaFerrari Aperta is a task that even the one percent of the one percent have a hard time doing. With only 209 examples ever built, all of which were sold before the car was even shown to the public, there's almost zero chance that anyone gets to buy one no matter how high demand is. Although, most people thought the same thing about the LaFerrari coupe, and then a devastating earthquake hit the Prancing Horse’s motherland. In show of patriotism, Ferrari got to work and built a special edition LaFerrari Coupe, the 500th ever made, and sold it at auction with the proceeds going to benefit the people of Central Italy who saw their lives and homes crumble before their eyes during the quake. 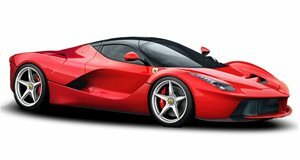 According to RM Sotheby’s, Ferrari is about to do the same thing with the LaFerrari Aperta, one of the few cars in the world that can make the world’s supply of LaFerrari Coupes seem abundant. There are currently plenty of disasters going on in the world so it’s easy to find charities in need, but the proceeds of this sale, assumed to hit $3.5-$4.7 million, will go to an unnamed cause. It may seem like a good PR move for Ferrari and for the most part, it is. However the reason it’s building a 210th LaFerrari Aperta is because Ferrari wants to celebrate its 70th Anniversary with a special car. Separating this Aperta from the rest will be a unique 70th Anniversary livery that has yet to be unveiled to the public. The 210th LaFerrari Aperta has yet to be built, but it's all but certain that a small group of ultra-wealthy will soon congregate to see which can outbid the others for a chance to own a piece of timeless automotive history. Maybe this time around David Lee, a watch and jewelry entrepreneur who had his name make it to the papers after Ferrari deemed him not worthy of receiving a LaFerrari Aperta despite owning a $50 million Prancing Horse collection, can finally get his hands on one.